Healthy foods are the only way to transform your self into a better and healthy you. The key to a longer life and healthy lifestyle is eating the right foods. The food that we consume has a big impact on our life and can determine our quality of life. You are about to discover the healthy eating secrets to losing weight and enjoying your healthiest, most energetic life ever. Fruit is one of the healthiest of all foods that you can eat. It is highly palatable and nutrient-dense, providing an excellent source of vitamins, minerals, fiber, amino acids, enzymes, and antioxidants. For anyone wanting to lose weight, fruit is essential to the diet. Besides providing more energy for exercising, the consumption of fruit fills the stomach faster, encouraging less high calorie foods to be consumed. Even if you eat more than the recommended serving of five fruits a day, your total daily calories consumed will automatically be reduced. Because fruits are low in sodium, they also help reduce the chance of gaining water weight; which is often an issue for many athletes and bodybuilders. There are literally thousands of different kinds of fruit to choose from, all of which provide excellent health benefits. Citrus fruits have large amounts of vitamin C and antioxidants that protect the body from free radicals (toxins) and prevent premature aging. Apples are a common fruit that contain malic acid and tartic acid. Both of these compounds stimulate the digestive system and detoxify the liver. Another popular fruit is the grape, which is often used for one-day mono-diets (eating 1 type of fruit or vegetable all day for just one day). Grapes have health benefits that include constipation relief, as well as improved kidney, digestive, and liver function. Pears, which are often not as popular as apples or grapes, can help maintain a healthy complexion, and can be used as a diuretic and laxative. A large fruit salad with a cup of yogurt can be a very healthy and satisfying, low-calorie breakfast. Eating a small piece of fruit 30 minutes before or after workouts will assist with appetite control also. Dried fruits can be a healthy substitute for chocolate or other sweets that you would normally snack on. Dried fruits have more calories than fresh fruit, but fewer calories than chocolate and candy bars. Popular dried fruits include apricots, dates, raisins, figs, peaches, pears, and apples. If you search hard enough, you can even find dried pineapple, mango, or papaya to give you a taste of the exotic. But beware that some dried fruits are not healthy foods and have added sugar, which undermines the benefits of eating natural fruit sugars, so read the ingredients list carefully. In addition to fruit, vegetables are one of the most natural and nutritious of all healthy foods. They supply the body with vitamins, minerals, bioflavonoids, and phytochemicals. Bioflavonoids have antioxidant and anti-inflammatory properties, while phytochemicals stimulate the immune system and decrease the risk of developing cancer. Vegetables are healthy foods and a good source of vitamins and minerals for your weight-loss, as they are low in fat and calories, yet provide fiber and extra energy. Since they are low in calories, eating an abundance of them everyday could never be harmful. The high fiber content will also fill the stomach faster and for longer periods of time; limiting the total amount of food you eat at that meal and also throughout the entire day. The vitamins, minerals, and phytochemicals in vegetables provide the nutrients necessary to enhance energy production within the muscle cells. This provides us with a natural feeling of vitality and the energy that we need to exercise in order to lose weight. Popular vegetables are: carrots, spinach, broccoli, cauliflower and Brussels sprouts. These types of vegetables have vitamins like B and C, as well as minerals such as: calcium, potassium, zinc, folic acid, iron, and thiamin. Adding garlic and onions to your meals can also cleanse your body, prevent cancer, and lower cholesterol. Plan to add two or three of these vegetables to your regular diet. Whole grains and cereals are a rich source of low-fat protein that supplies the body with complex carbohydrates, fiber, vitamins, and minerals. 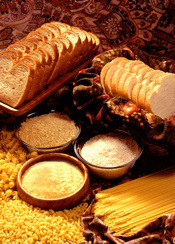 Whole grains are one of the most healthy foods, and should be part of your diet on daily basis. For weight loss and weight control purposes, it is important to consume primarily complex carbohydrate foods, such as brown rice, whole oats, barley, and couscous. Simple, refined carbohydrates found in many convenient foods lack natural nutrients, meaning that some of the energy will be converted into fat and stored by the body. Also, complex carbohydrates are broken down into glucose more slowly than simple carbohydrates, and thus provide a steady stream of energy throughout the day. Additionally, these foods contain large amounts of fiber, that bind to harmful cholesterol and allow the body to pass it out of your system. Beans have nutrients like folate, potassium, iron, and magnesium, in addition to fiber and vitamins. Studies have also shown that eating half a cup of cooked beans regularly can lower your cholesterol by at least 20%. Beans, like lentils, chick peas, pinto beans, dried peas, and mung beans, can be easily added to soups and stews. The next time you are planning dinner, try substituting the typical white rice for brown rice or couscous. A nice salad followed by a hearty bean stew is another healthy alternative for dinner. These low-fat meals provide a great flavor, essential nutrients, and disease-fighting antioxidants. Fruit juices and smoothies are easy ways to get the benefits of fruits, which provide the body with nutrients, antioxidants and promote the elimination of toxins. Having a cup of freshly squeezed orange or grapefruit juice with your breakfast can cleanse the body of waste products that may not have been eliminated the night before. Juice made from vegetables should be consumed at lunch or in the afternoon, for the best utilization by the body. Vegetable juice rejuvenates the body by restoring the alkalinity to a usually acid body. Smoothies are also healthy and are made up of soft fruits, milk, or yogurt; and they are another healthy alternative to eating fruits. A smoothie can be as simple as combining a banana and a mango with either low fat/fat free milk, or yogurt. Smoothies can also be more complex by combining several fruits with milk, yogurt, and even mint for extra flavoring. Again, beware of added sugar in some juices and smoothie products. 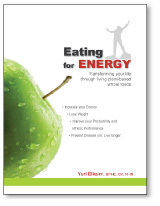 Eating for Energy is a revolutionary living foods nutrition e-book; all the healthy foods you need to pump up your energy and lose weight are contained in this e-book. This e-book consists of a 12 week plan, over 100 recipes, and a special fitness nutrition component. Don’t second guess what to eat; instead, learn how to eat and transform your body, have more energy, look great, feel fantastic and perform, through living plant-based whole foods. Yuri Elkaim is the author of the Eating for Energy e-book. This e-book has a wealth of solution-oriented action steps for readers, and is framed passively. If you are into healthy foods, this e-book sheds light on dietary choices in a comprehensive and simplistic approach. Eating for health is not only recipe e-book, it also tackles health promotion, productivity and disease prevention; and healthy dietary lifestyle choices serve to increase one’s energy. Learn more about bringing health, wealth and happiness into your life.